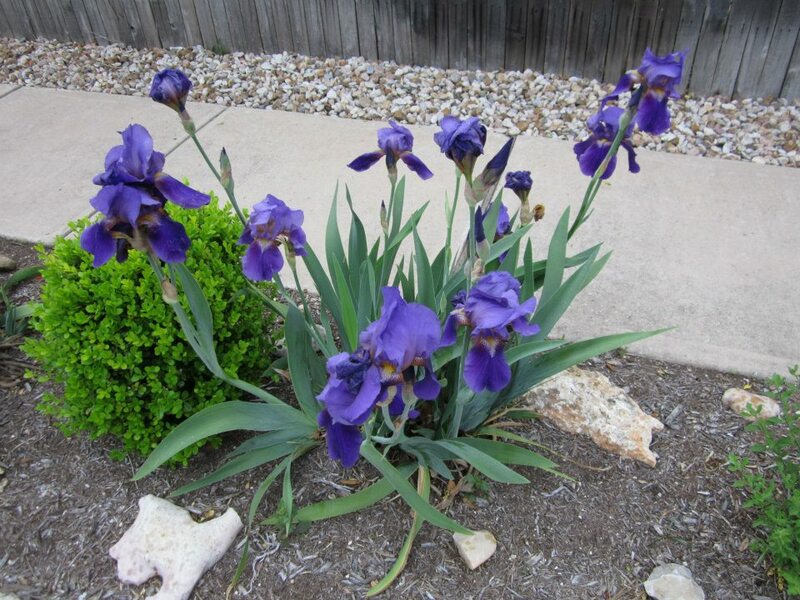 Did you know the Bearded Iris is an excellent Xeriscape plant for the Central Texas landscape? Well, it is and happens to be one of my absolute favorite plants for so many beautiful reasons. Iris are stunning plants named after the Greek goddess who rode rainbows and rightfully so, they come in a beautiful array of colors and are highly coveted by gardeners everywhere as a lovely addition to the landscape. This is my nuisance strip which includes dwf Boxwood, Salvia Greggi and Bearded Iris. Little to no maintenance, very low water and magnificent color in spring from the Iris, then all summer from Salvia Greggi. It is alaso evergreen which is a big plus. 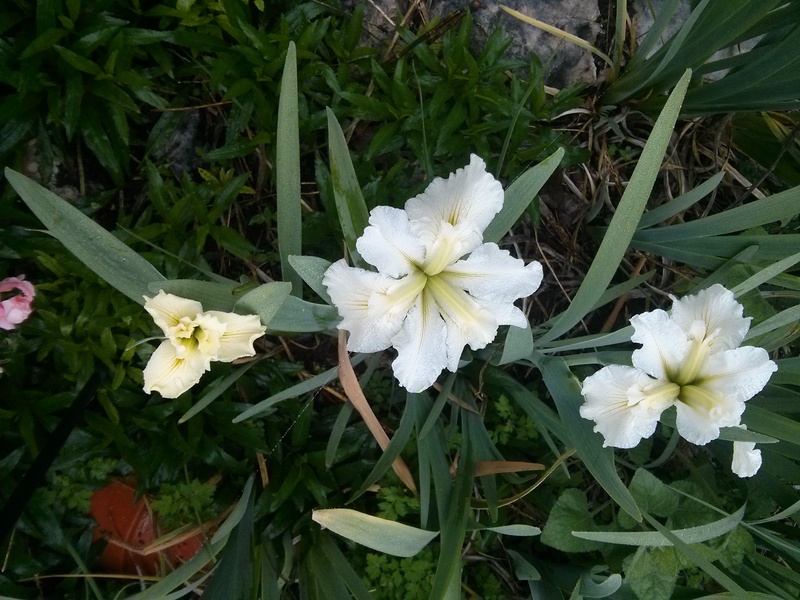 The two most common low water Iris are bearded and dutch and both do well in central Texas. Louisiana Iris do well if you have a boggy or wet spot but for low water, but bearded and dutch iris is the most bang for your buck in my opinion. They come in a rainbow of colors and are as fragrant as they are lovely. Iris prefer sun, well drained soil and like any other plant, lots of great compost in the spring. 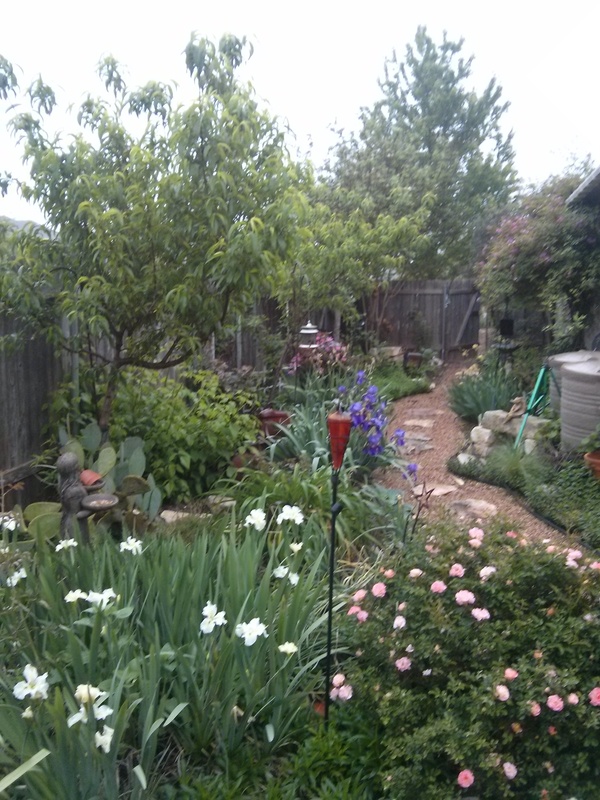 White dutch iris in a Xeriscape bed with drift rose and fruit trees. 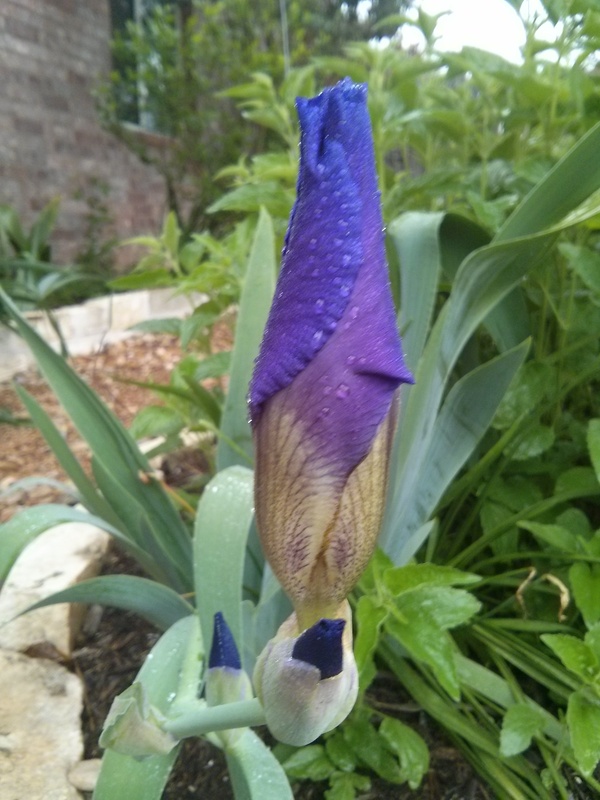 Dutch Iris are bulbs, not rhizomes and will not need to be divided the same way. 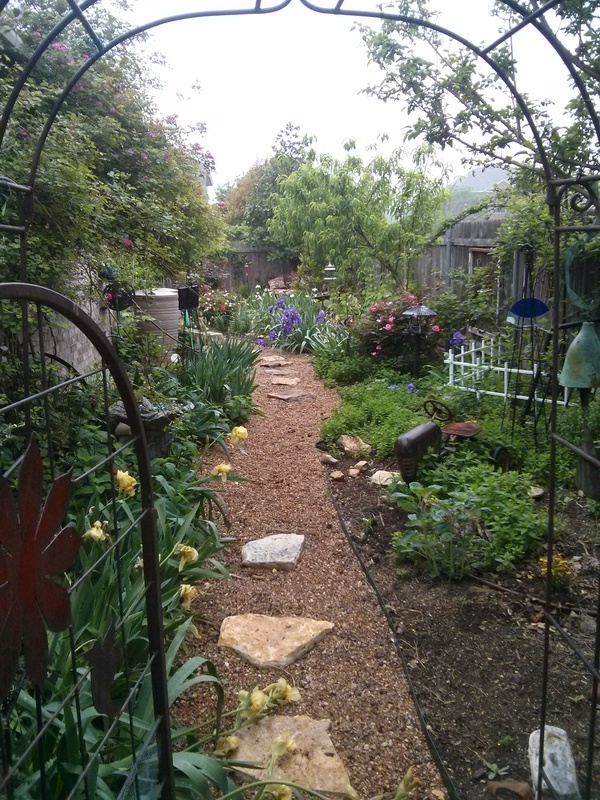 In fact it is not necessary to divide until they take up too much space then you can simply dig up a section at a time and spread throughout your space or share them with friends. Dutch Iris is similar to the Siberian Iris in shape and limited colors but the dutch is shorter at 2-2.5′ where the Siberian can reach 3′. 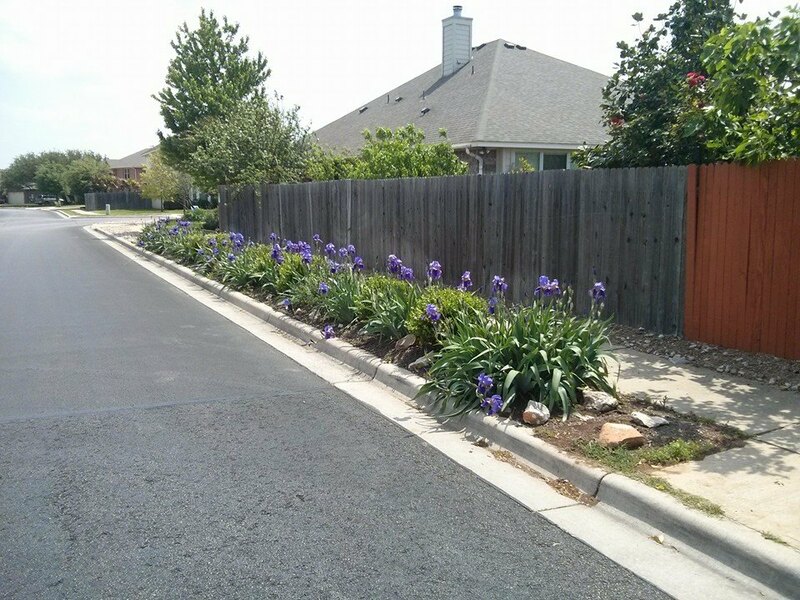 Dutch Iris are not available in as many colors as the bearded but it is also super drought tolerant and the blooms last longer into the spring season than Bearded Iris last. Much like the bearded, they make excellent cutting flowers. Iris have lovely blue/green foliage all year-long and you do not need to cut back the leaves after their bloom season but you can cut back spent bloom stems and dried leaves after the blooming season. 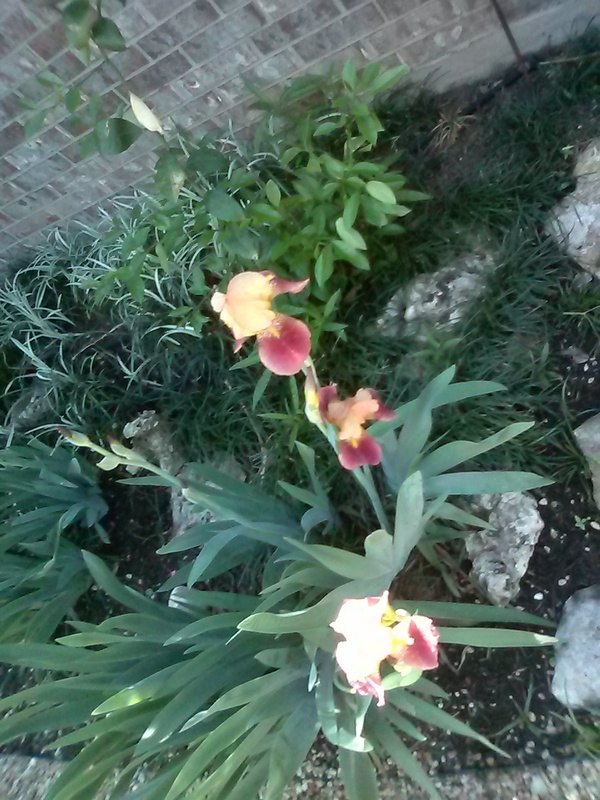 Here we have yellow, blue, white and pink colored iris that fill the spring garden with color until the returning perennials get their footing. 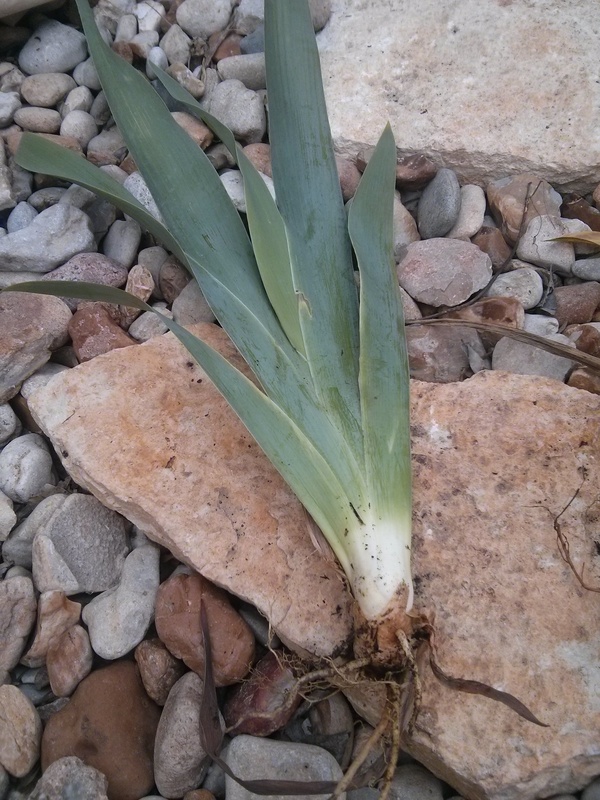 Iris require very little maintenance to speak of during the year but for a little removing of dried leaves and stems after the bloom season and a need for being separated every three or so years. 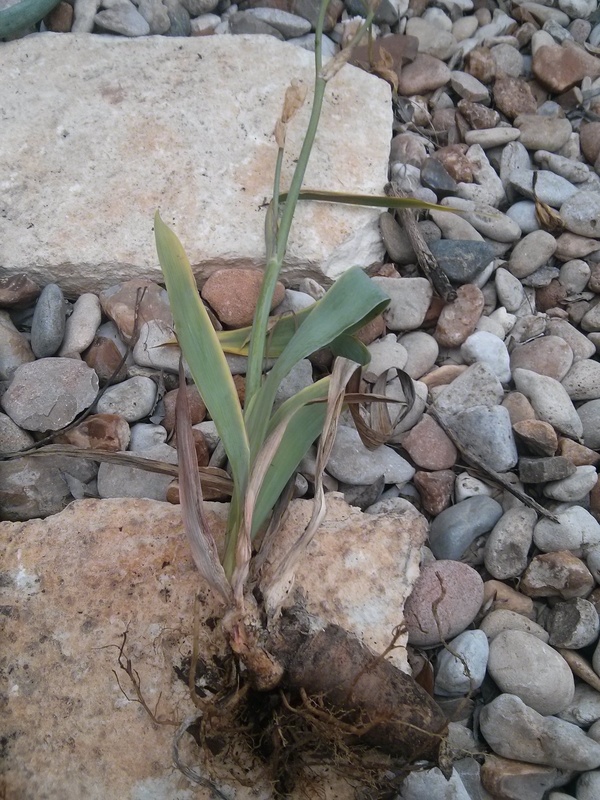 The first step to dividing bearded Iris is to remove them from the ground with as much root as possible. Now separate the living plants from the rest of the rhizome being sure to include root systems with each separation. This can be done by cutting the pieces with a sharp tool or by simply breaking the sections apart with your hands. Here is where you separate any left over rhizome pieces from the cluster of plants and place them into separate piles. The old spent rhyzomes are discarded as they will no longer bloom which is the reason for the division in the first place. This piece will also be discarded as the spent blooms will not produce more flowers in the future. 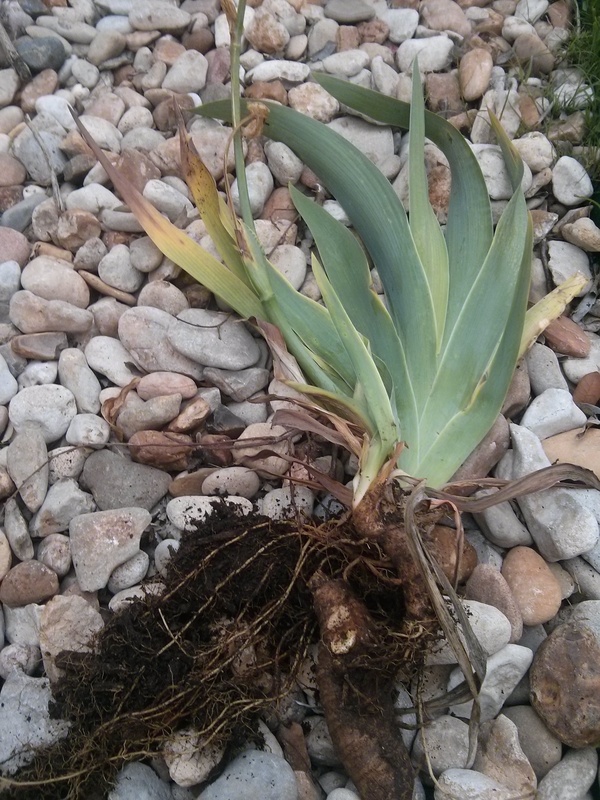 This is a viable new plant ready for transplanting or sharing with a friend. Bearded Iris are super easy to plant and unlike a bulb do not want to be planting very deeply. 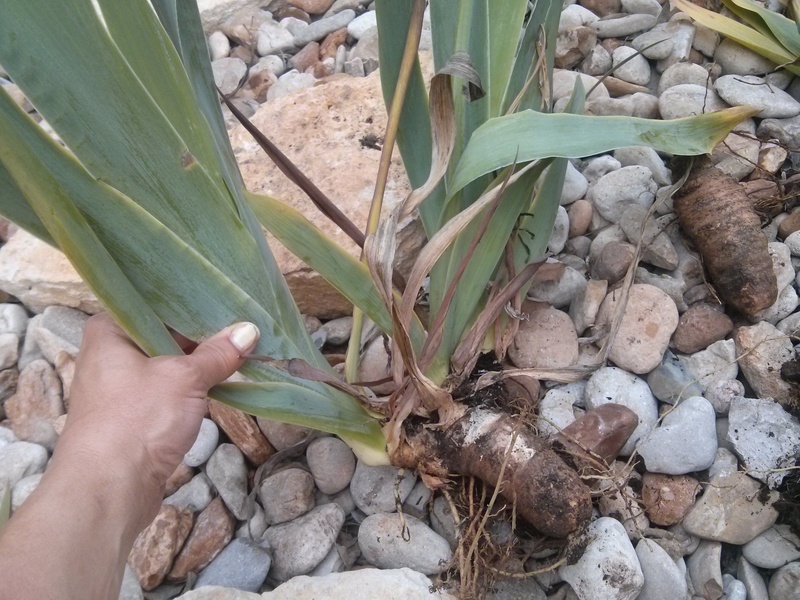 Bearded Iris in particular (a rhizome) prefer to buried in a shallow hole where the rhizome can dry thoroughly between watering. Beautiful with companion plants or on their own. Iris are excellent in perennial beds and make a great filler for spaces between color cycles in the spring. A vibrant array of colors and bloom times make this low water plant and excellent choice for our landscapes. 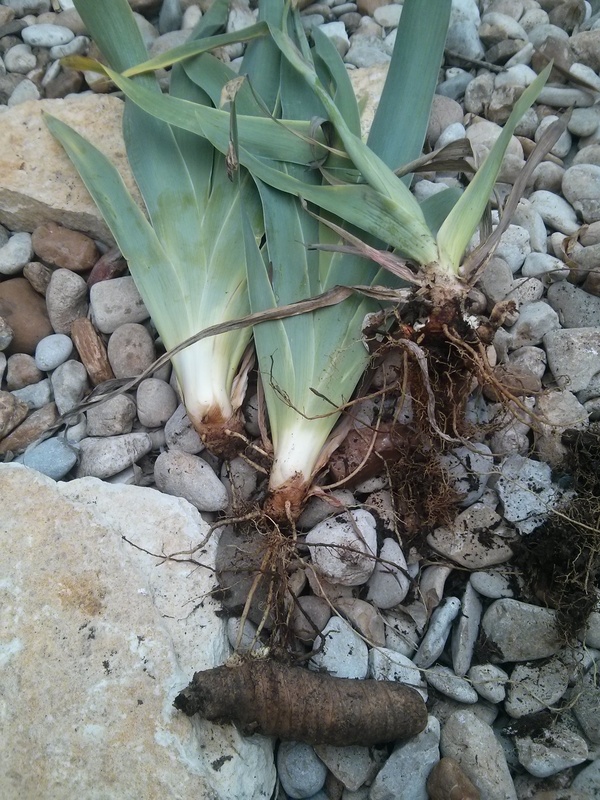 Hi Lisa, Where can I buy the Bearded Iris rhizones and when is a good time to plant them? Love our blog! Denise, you can find bulbs online, nurseries and even at big box stores. 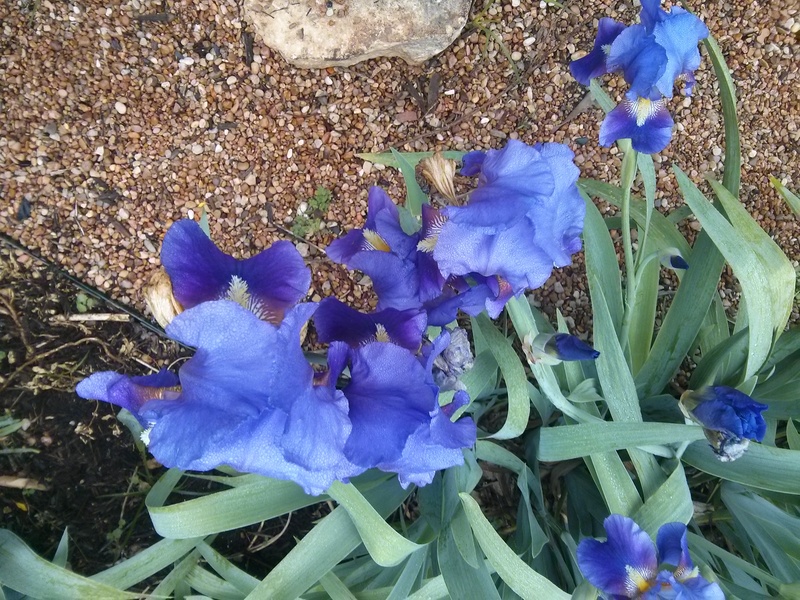 Love your irises! Beautiful! Especially the purple ones. Do you know what variety the purple one in the second to last picture is with the tons of blooms on it? Hi Brittany, unfortunately I do not, I have been carrying that Iris around with me for over 20 years and have shared hundreds of them. Hi Lisa, great information here. Thank you. 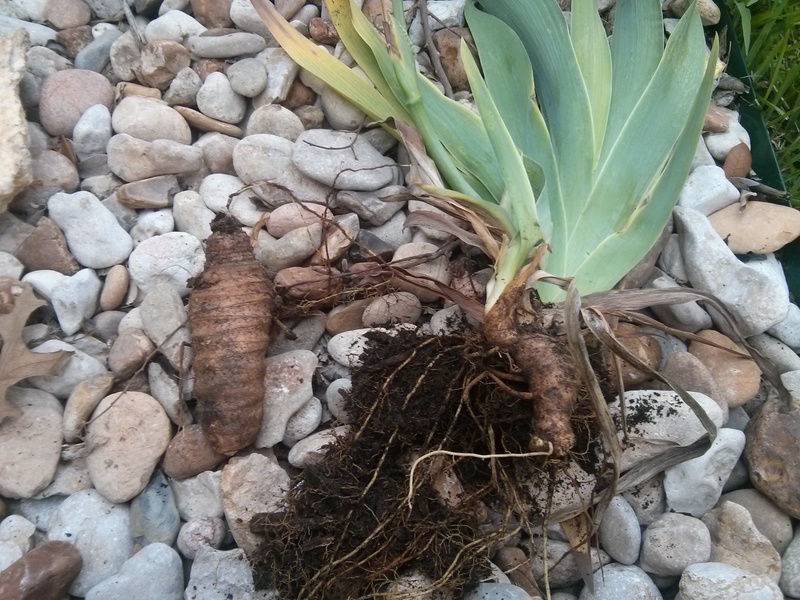 I have been gifted a huge bag of bearded iris rhizomes. Can I plant them now or should I wait until next September/October? I’d sort of like to get them in the ground now if at all possible. Thank you! I live in North San Antonio. I would plant them as soon as the last frost passes and water in well but don’t let them stay wet between watering. They may surprise you with spring blooms.